I also got one of the rear "hub caps" done and the spare. Only thing is, now I'm short one wheel to finish the other. Any one have an extra from their Willys build they'd be willing to sell me with the original non-dirt tire. The XZL's turned out perfect man! You're right Taco...I really like how they look. Well, all 4 wheels and tires are complete and mounted. They are fitting the body perfectly and really look scale. I have one more "hub cap" to do once I find a proper wheel to make it from. Man thats looking nice, the wheel backspacing looks to be perfect to go with axles/body. I bet you could build 2-3 other bodies that would fit that chassis/wheels/tires perfect. Funny you should say that...ever since I started this, I've been kinda thinking the same thing. 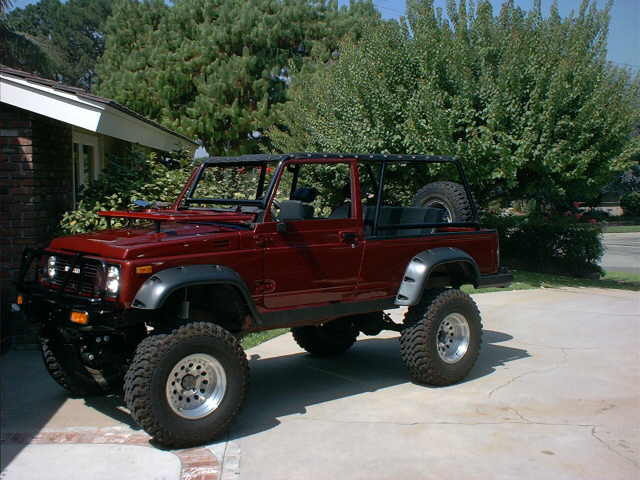 A Jeepster would be a direct match, but I wonder if there any others with a 101" WB. Maybe not exact 101" WB but then you could alter the scale of the body to match WB, for example samurais are smaller than jeeps in width and wb but if you make the widths match how close would the wb be. Hmm who knows tires and wheels might still work out for the other bodies depending on what scale they end up, heck sticking with the samurai theme they had tiny tires (I think 205-70r15? cant remember) so even if scale is larger on body the tires might look right under there. Oh yeah and LWB samurais are cool and rare here in states! I had a ton of plans in my head for my tintop samurai before and more than one included stretching it to LWB for either pickup or suv style.